I spent a good portion of today giving the house its weekly cleaning. You know, dusting, vacuuming, polishing the furniture, taking out the garbage–all those things that I would rather not do. And every time I clean, I always think of a particular scene from the movie, Penny Serenade (1941). For those of you who have seen it, you already know the story. For those of you who haven’t, this is the plot in a nutshell: Irene Dunne and Cary Grant fall in love and attempt to adopt a child, only to encounter an unexpected tragedy that nearly tears them apart. It’s what everyone calls a tearjerker, although to be honest, I’ve never cried during this movie. Despite its downbeat plot, Penny Serenade is great because 1. I absolutely adore the pairing of Grant/Dunne. Not only are they absolutely perfect together, but I think she was Cary Grant’s best leading lady. And 2. I love how she works in a record store at the beginning of the film. From what I’ve seen, 1940’s record stores were pretty awesome. You could go into a booth and listen to records. If I were alive back then, you can bet that’s where I would have been working. Look at her! She looks absolutely adorable. Her hair is up in a turban/scarf, she’s wearing a cute dress and apron combo and if that weren’t enough, she’s also wearing heels. Heels! For cleaning and scrubbing the house! 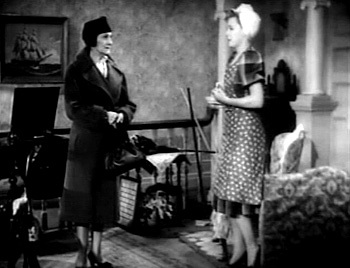 Since I wasn’t alive back in the 1940’s, I’m not sure if this is how housewives really dressed while cleaning or if this was Hollywood’s version of dressing for housework. After all, think of how many times actresses look absolutely glamorous and beautiful while on their deathbeds. Still, it seems absolutely ridiculous to wear high heels while cleaning, although I’m not sure if there was any other kind of shoe for women to wear. I think they had to wear heels by default. For more on 1940’s fashion, there’s a really informative wiki page here.